It’s been so nice that work has slacked off some, letting me get some more games in, albeit at a weird schedule. 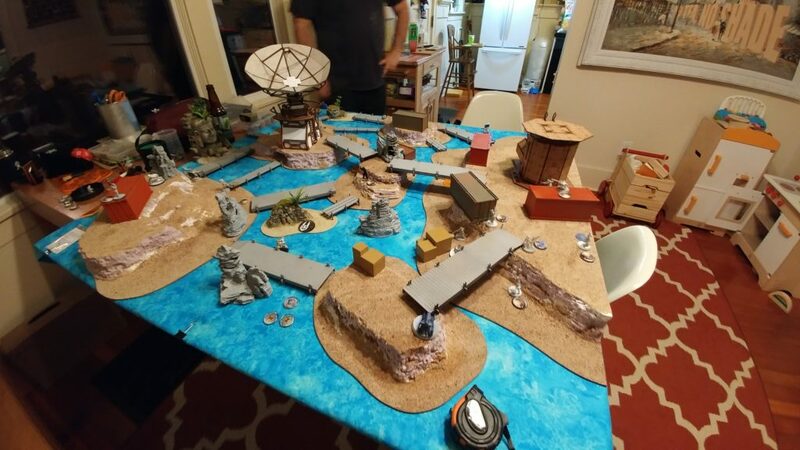 Thankfully, Adam is around on weekends and had just put some serious time into his island table from our last game at his place. Some paint and an actually blue table mat go a long way. Just look at that! Beautiful! 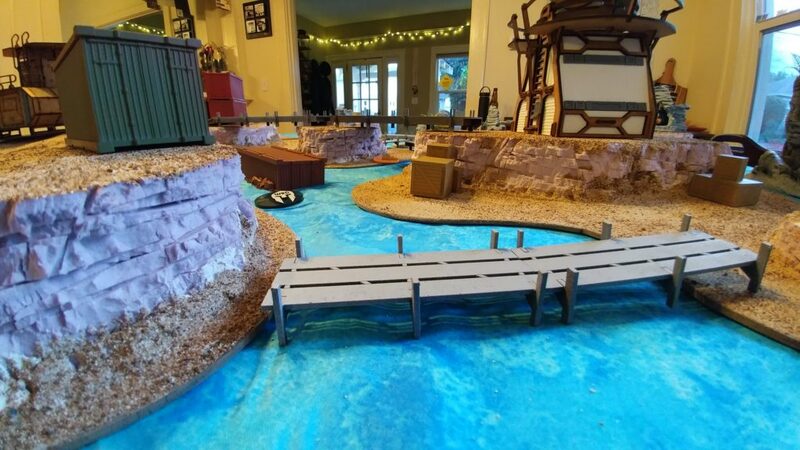 He’s not even done painting the islands yet! I’m really excited to watch this table evolve as Adam puts more of his passion and time into the project. He’s doing a great job! 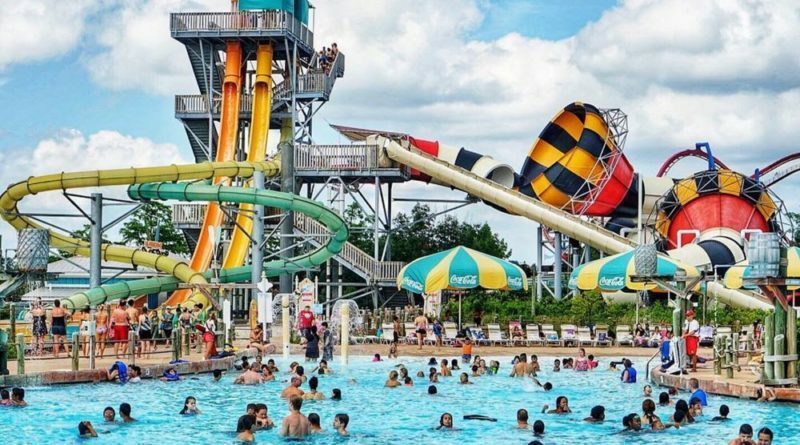 We joked that it looks a bit like a water/pirate themed amusement park… and it kinda does. 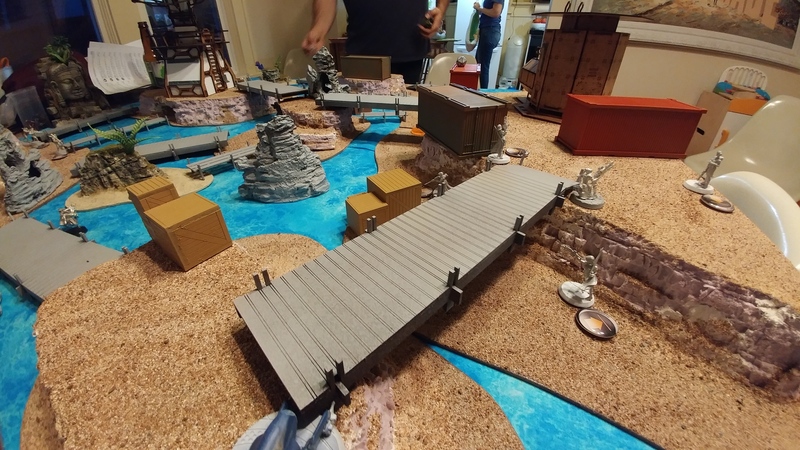 At first glance, the table feels like it’s really open, but as you can see, once you get down to model level there’s plenty of LoF blocking features, especially if you’re willing to go prone. 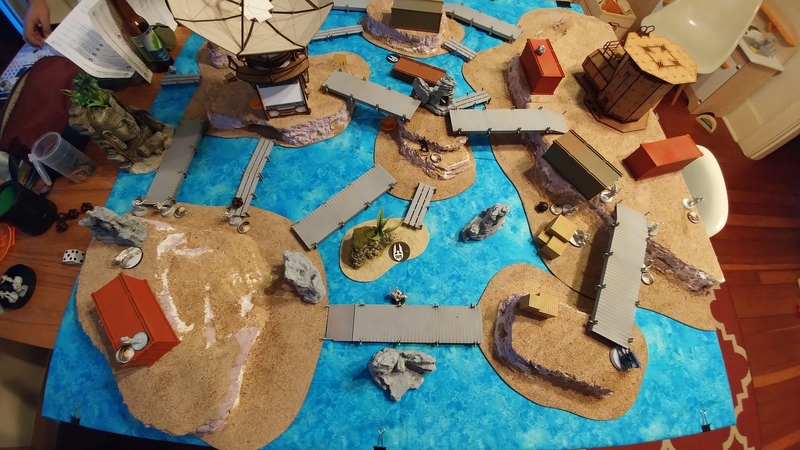 As a result of the difficult terrain and the frequent need to go prone, it’s a really slow-moving table, but it gives you some really interesting tactical options and problems to solve. 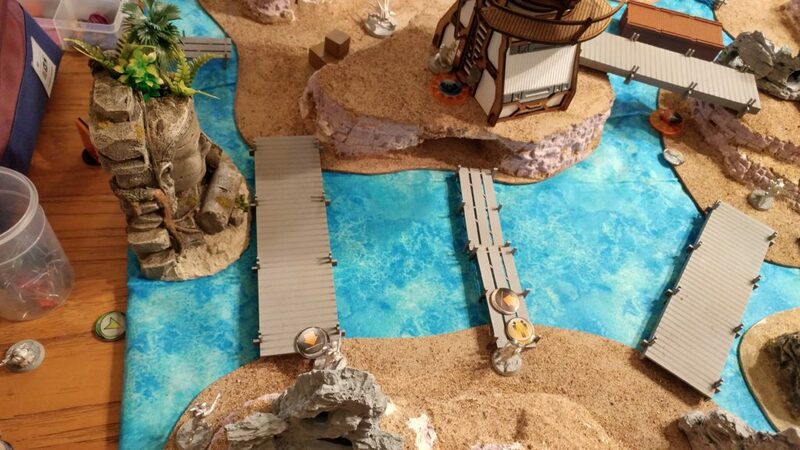 We elected to try out Power Pack again, just to really ratchet up the difficulty–the funny split deployment zones on this table really wreak havoc with your tactics and pull you out of your comfort zone. I had just been wondering what the point of Odalisques were in the text group we’ve got with the Infinity locals here, and I figured it was time to actually try them before I continued mouthing off. I see a fair amount of USARF in my meta, and one of our resident USARF commanders cannot get enough Grunt snipers on the table, so that sort of downplays the effectiveness of NWI for me. Gotta try it before you knock it though. I just sort of threw together a list built around a core of Odalisques without really thinking about it. The Power Pack deployment zones basically dictated my deployment, so there isn’t really a ton of stuff to discuss here. Sekban Haris on the left, Odalisques on the right with the two Hafzas on ground level so the FO could beep boop some buttons. I scattered flash pulse bots and the warcor in various vantage points, then stuck my trusty Al’Hawwa AHD next to the central objective. I haven’t had time to build my Odalisques yet so Adam graciously let me proxy them with some Moiras. My Hafza Spitfire Lt pretended to be a Djanbazan HMG on the left, which I think encouraged Adam to counter deploy that a little. There really wasn’t any good place to put anything. 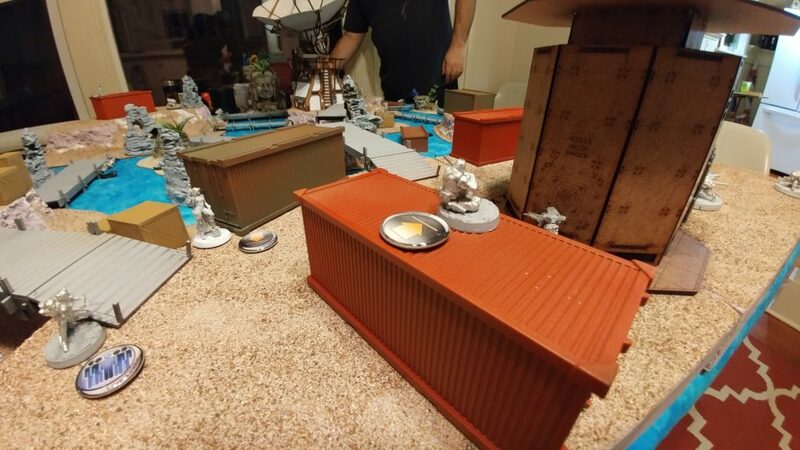 I just haphazardly scattered the Odalisques and Hafzas on the right side and hoped that the shipping containers would protect me from the worst of the AROs. I figured that the Sekban might actually need to push buttons this game, so I put them as far forward as I could get them. Adam collected his Druze and Brawlers on my left, with the Clipper in cover and watching most of the board. He hid his HMG Druze in the back, prone, and everyone else was hugging the dirt too. To handle my Odaliques, Adam dedicated a Peacemaker and its Auxbot as well as a Pathfinder remote. Adam’s Hunzakut declared herself queen of the left objective (from my perspective), and Adam covered both flanks with some Fugazi. He futher backed up his bots on his left with a Brawler AHD lurking deep in his deployment zone. I had originally planned on putting my Djanbazan sniper on the same shipping container as the warcor, figuring that Adam’s Druze might be on my right, but with them all on the left with their flank exposed, I dropped him on the right side, ready to climb atop a shipping container and be in full view of Adam’s link. 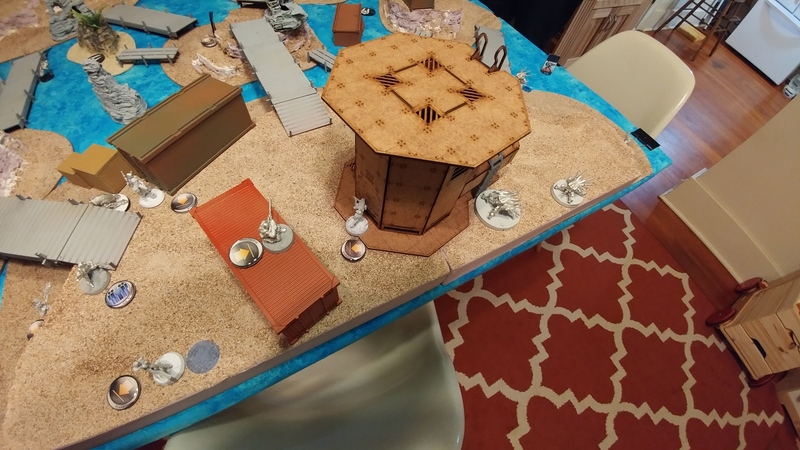 Adam brought Le Muet out of reserve and stuck him behind some boxes just outside his left deployment zone, making use of Le Muet’s forward deployment. I walk on a EXP CCW-toting Yuan Yuan next to the Djanbazan sniper. My other Yuan Yuan sees a circular template sized hole right behind Adam’s Druze and Brawler blob and tries to sneak in. Unfortunately, Valerya hacks him off course and he lands in front of them instead of behind… he might as well have never existed… The surviving Yuan Yuan attempts to huck a smoke grenade on top of the auxbot on the other side of the shipping container, but fails, so I’m forced to use the dead Yuan Yuan’s order to do it again. I spend a few orders trying to CC the Auxbot, but it keeps electric pulsing. Fortunately, my Yuan Yuan passes BTS twice. The Djanbazan climbs up the shipping container and starts blasting away. Due to the saturation zone, I’m forced to split burst. I try not to engage multiple fireteam members at once, instead electing to shoot only one at a time with the second shot going to some unlinked trooper. My first shots force Le Muet into cover, but I fail to wound him. Over the next few orders, I manage to take out the Fugazi on my right, Valerya, and the Brawler doctor, but the LGL Druze finally crits me, putting a stop to my rampage, or so we thought. I regen the Djanbazan successfully, and take one more potshot at the LGL and KHD Druze, but they both pass ARM. I turn the Warcor’s order into a pile of auxbot scrap, finally landing an EXP CCW hit with the Yuan Yuan, and pass the turn. While I didn’t do as much damage as I would’ve liked, Adam’s link team is pinned by the Djanbazan sniper. Adam’s Djanbazan removal tool of choice is the nearby Peacemaker, who scoots around the corner just enough to see the Djanbazan but not the Yuan Yuan. I shoot back in my zero range, and take a hit. Thankfully, I pass ARM and fail guts, scooting away and out of LoF atop the shipping container. Adam sends in the Pathfinder instead, but my Djanbazan gets lucky and knocks it out over two orders. Vexed, Adam drives the Peacemaker into point-blank range and blasts away, catching the Yuan Yuan and the Djanbazan with shotgun fire. Miraculously, my Djanbazan wounds the Peacemaker, but the Yuan Yuan is down for the count. 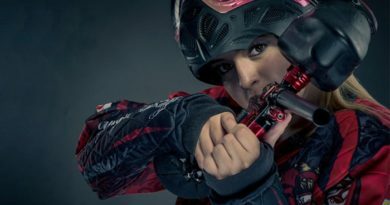 One of the Odalisques can see this and finishes off the Peacemaker with her contender. Adam’s dice have betrayed him–he’s now 5 orders and two dead bots into taking out my Djanbazan. Out of options, he sends in Le Muet. Three orders later, my Djanbazan is finally dead, but Le Muet has taken a wound and no longer has ODD. 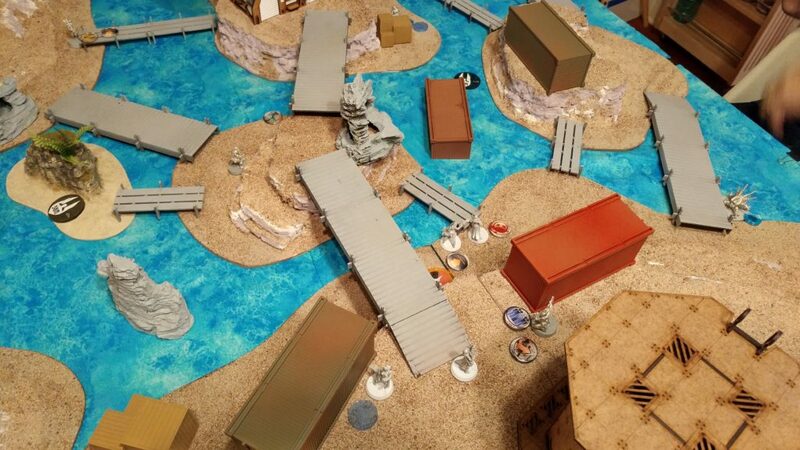 With his link team unpinned, Adam surprise-shot FOs my Sekban and drops an E/M grenade on them, but the grenade just sinks into the water, having missed entirely. 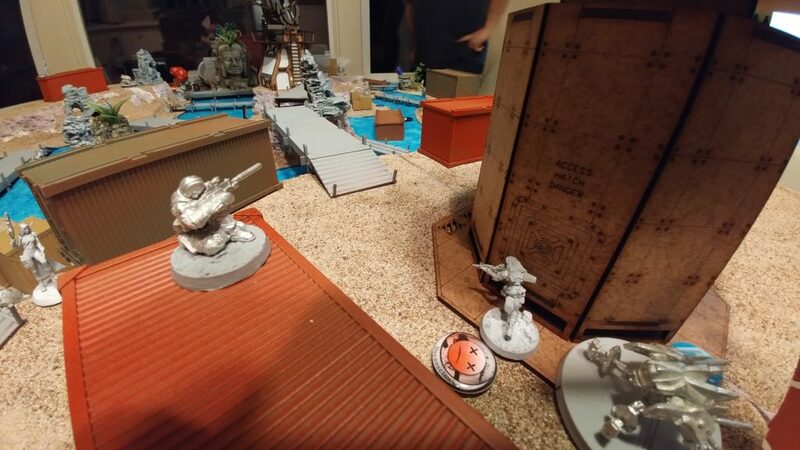 Adam brings in a Bashi SMG behind one of my flash pulse bots and guns it down before passing the turn. My Al’Hawwa can’t figure out what button to push and keeps flubbing WIP rolls, but 4 orders (including the Warcor’s irregular order) later, there’s a mine covering the central objective and a just barely pushed button. I need to get to another button to make things difficult, so I advance the Odalisques upfield, pushing the Hafza FO towards the rightmost console. Along the way, one of my Odalisques guns down the Bashi in my backfield. There’s a keyhole that I can shoot through to get the clipper, so I throw the Odalisque spitfire at it at max range. I eat a missile for my trouble, but roll well on ARM and manage to survive, going into NWI. 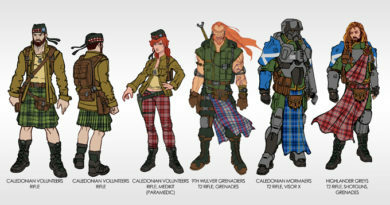 The next order, I finally sneak some shots through and knock out the missile bot. The way clear, I reveal my Hafza FO, who apparently can’t push buttons either. After another order he finally gets it and gets me the right objective. I mop up Le Muet and the Druze KHD with the Spitfire, and the Hafza HRL gets the LGL Druze before I pass the turn. Adam’s Hunzakut is now in the sights of two link teams, but all she has to do is push the button. Adam throws caution to the wind and throws her at the leftmost objective. Shockingly, she survives the combined fire of two link teams and an assortment of flash pulse-wielding troops with nary a scratch, pushing the button with aplomb. Adam is running low on specialists, so he tries to get his Brawler AHD into the fight. Unfortunately, the Odalisque spitfire rebuffs his advance, knocking him out with a lucky shot. Adam’s HMG Druze fares better, knocking out my Hafza HRL and forcing my FO Hafza prone, but the Odalisque spitfire drops the HMG Druze before he can do any more damage. Adam spends his Lt order moving his Brawler Lt into a safer position and passes the turn. I peel the Odalisque spitfire off to get my Extreme Prejudice classified off of the nearby downed Pathfinder, and then run the remainder of the team (and the all important DataTracker) into base to base with Adam’s console. They get flash pulsed on the way by the remaining Fugazi, but the FO Hafza manages to go into suppression to protect the blinded DataTracker. I need to take out the Hunzakut to prevent any shenanigans, which the Sekban do handily. With my last few orders, the Sekban take out Adam’s last Fugazi and set up to cover the left- and mid-field. Yikes. Adam’s dice were just rubbish this game. It should not take 8 orders to take out a Djanbazan sniper on a roof from within 8″ when you have a shotgun or with Le Muet. The saturation zone really helped me out here. Adam was a consummate gentleman the entire time, even though by the end of the game all that was left was a lone Brawler Lt. We sat down afterwards and talked through the game. Yes, I had a good position with my Djanbazan, and yes, I did a reasonable amount of damage. The situation was more than salvageable though, but losing both the Peacemaker and the Pathfinder in his active turn over the course of 5 orders, and then spending 3 more on Le Muet just to take out the Djanbazan was quite painful. 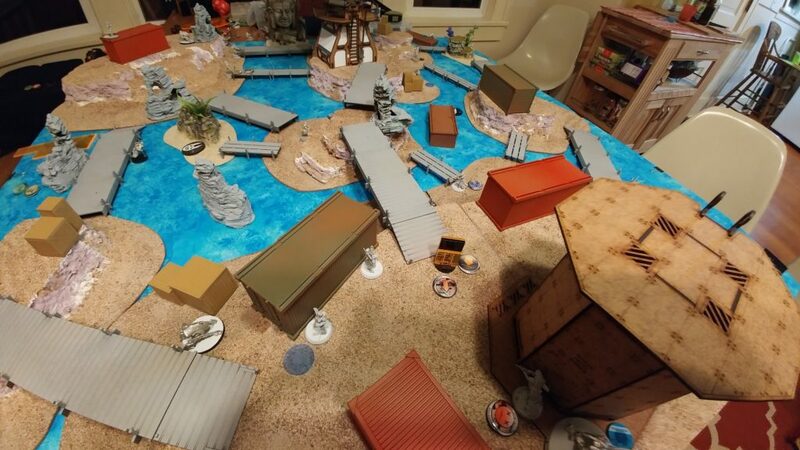 At that point, my Odalisques had total control over that flank, and even though the rangebands were bad on the spitfire, I was able to go crit fishing and dice down most of Adam’s remaining units with simple weight of fire in the next turn. A big thanks to Adam for playing it through till the bitter end! Hopefully his luck turns in the upcoming Las Vegas Open! Okay. I now understand the point of Odalisques. They go fast, they punch above their weight class, and they’re annoying to remove. Have to play around shock, which is quite prevalent in my meta, but I could see taking them more often. I’m less keen on the Sekban Haris. While they’ve done stuff in the games I’ve taken them in, they don’t shine quite as brightly. I think what’s happening in my opponents are playing around the HRL and just avoiding them, and they’re just a quiet, reliable workhorse of a unit. Perhaps I will get around to using them in a 5-man core soon. I even have the models built for that! I would like to try using the Al’Hawwa more offensively. So far there hasn’t been a real need, but surprise-shot boarding shotgun sounds pretty great. 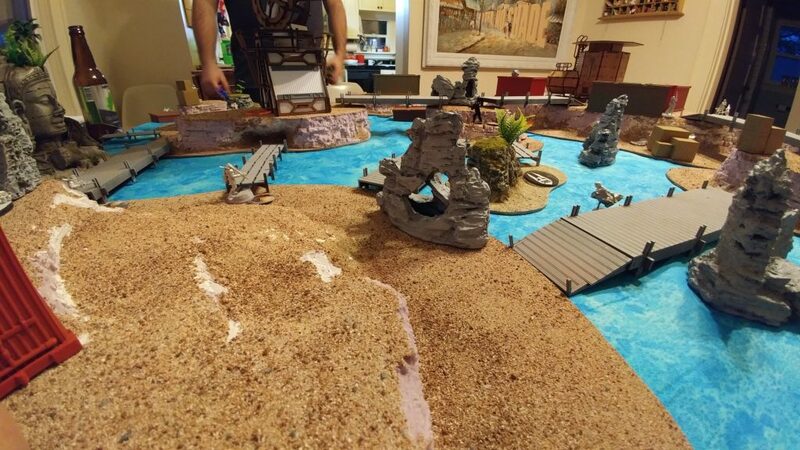 Power Pack makes long-range weapons much more relevant, and Adam’s beautiful mobility-reducing table (water is very difficult, beach is difficult terrain) make them that much more important. Yuan Yuans: smoke when and where you need it. Djanbazan sniper was amazing this game. I can really see the value of units like the Tiger Soldier MSR and infiltrating snipers now. Having a horizontal cross-map flanking shot on a link team can be devastating. I will definitely need to abuse that with my Spektr MSR in Nomads. I like the solo Djanbazan. I see why people use them all the time in vanilla. Odalisque link team composition is interesting. I guess what I had is the accepted optimum, but I’m still not sure. SMGs continue to confuse me, but I’ll figure it out eventually. I get why they’re good but I kinda like rifles more if I’m not going to be throwing them into suppression regularly. Saturation zones HURT. I think I played them to my extreme advantage this game, and played around them in my active turn by using high-burst weapons. The Druze require a bit of finesse. They definitely encourage you to clump large numbers of units. Clumping is bad! Bots are good… man I need to buy Adam new dice or something. I think the right thing is a core + maybe haris, and a bunch of Duos. Or lots of bots. 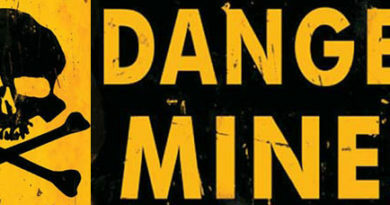 Guest Batrep – Danger, Mines!